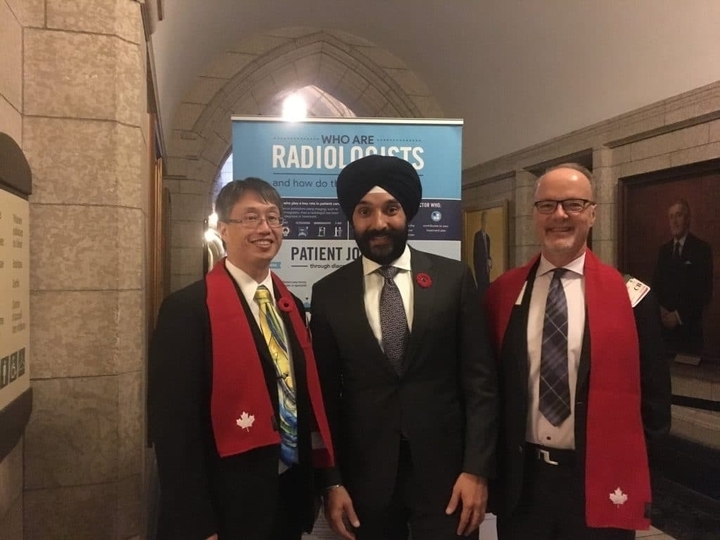 Thank you for your support of radiology and radiologists in Canada. I’d like to take this opportunity to remind you of the CAR’s strategic pillars for success: Advocacy, Education, Patient Care, Research & Innovation and Engagement. Advocacy – Seen more, heard more and better understood. In Advocacy, the CAR has punched way above our weight class. The Day on the Hill was a shining example of this with over 24 meetings with MPs and a successful reception with over 30 MPs, ministers and senators in attendance. Our 2019 Pre-budget submission included asks for medical equipment renewal, funding for AI research, the launch of clinical decision support tools in Canada and a medical imaging strategy to eliminate TB in Canada’s north. We were very pleased that the House of Commons Standing Committee on Finance heard our requests and released their 2019 Pre-Budget Report, including a specific focus on MI technology and a recommendation for additional equipment to help eradicate TB. This is a direct result of advocacy efforts by many of you – our hardworking volunteers, members and staff. The Value of Radiology Project Part 2 is underway, commissioned by the CAR to be published by the Conference Board of Canada. We continue to foster strong relationships with provincial radiology associations and embark on initiatives to help radiologists be better ‘seen, heard and understood’ nationally. We have launched RAD Academy, the CAR’s learning management system, which has had huge uptake from our membership. The CARJ Insights4Imaging resides there, and as more content is added to this repository, we aim to make this the premier national source of CPD for you. Accreditation remains a cornerstone of CAR activity, which we are planning to expand on in 2019. The CAR 2019 ASM program is complete and the theme “The Future of Radiology,” has had a greater number of abstract submissions, member and industry participation than any ASM before. I look forward to seeing you there! We continue to work on national practice guidelines, clinical decision support and the new AI White Paper on Ethics and Legal considerations publishes early this year. The AI Working Group has grown leaps and bounds. Subgroups including Tech & Apps, Legal & Ethics, Education and R&D have launched. The CAR is a signatory on the Federal Strategic Innovation Fund grant application in concert with academic institutions across the country that has now made it to the second round of consideration. If selected, this will be a launching point for AI research in Canada – what we are calling Augmentative Intelligence. These tools will make our radiologists better and more efficient. Our website has a new design, our membership is increasing, and our social media presence grows daily. We are developing strong ties with academic institutions across Canada, including Canadian Heads of Academic Radiology (CHAR). A perfect example of our burgeoning relationships is a recent request from the University of Toronto for the CAR to give (annual) presentations at the Toronto Organ Imaging Update. An encouraging national Nanos survey indicated that there is high recognition of what radiologists do, what our importance to Canada’s healthcare system is, the support for initiatives such as MI equipment renewal and the use of AI tools to augment radiologist work, in the Canadian population. We launched our community on The Rounds, a secure social media platform for Canadian physicians, which serves as a virtual meeting place for members to exchange ideas and collaborate on projects into the future. Our corporate engagement with industry partners has also hit a new high, with record participation in the ASM and opportunities to work together in 2019. The CARJ has a new editor-in-chief and is looking to grow its impact factor and offerings in the years to come. The examples shared above are a few highlights of work accomplished as well as ongoing priorities for the future. None of this happens without you; our members and volunteers who keep this organization vibrant, engaged and active. The CAR aims to not only talk the talk but also to walk the walk. It has been my distinct privilege and honour to be your President this year and I look forward to the coming year!